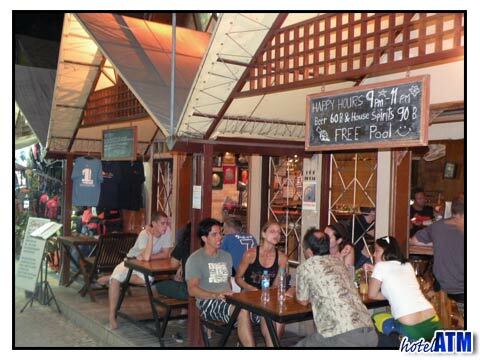 The Phi Phi Sports Bar is the place to watch sport, play pool and hang out in a friendly atmosphere on Phi Phi Don Island. Just down from PP Scuba it is only 60 meters back from the beach and an ideal place to hang out for while. 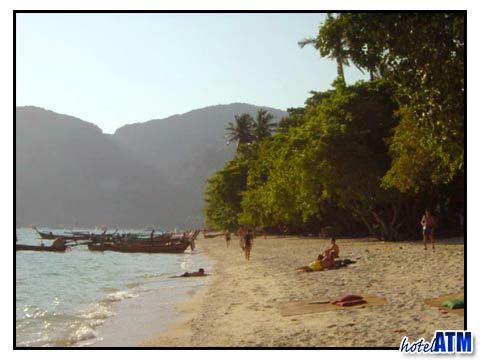 The Phi Phi Island Sports Bar brings together all that is fun in the Phi Phi nightlife scene but still gives a chance for you to unwind with a few home pastimes. The outdoor decking area is a cool place to watch the day go by as locals and tourists alike meander down this road. I prefer this place in the evening when it is a bit cooler, a chance to gaze at a star or 2 if they are out. The Bar itself stretches to the Back of the Sports Bar and is the main focal point where you can order a beer or chat to the barmen or bar girls who ever is working that day. The TV scenes show the latest in sport. Of particular interest seems to be the Premier League from England and this is followed avidly. Rugby, Formula 1, Cricket, Aussie Rules are all followed with passion and so it can be good to get in early to command a seat at the bar for the big nights. The Pool Table takes center stage in the Sports Bar and has been home to many a local competition and league. It not frowned on to bring your own stick but few can as they are on holiday. The Menu has a good selection of local beers to warm your heart and get you in the mood for the big match. The Chang Beer (sponsors of Everton FC ) is a big favorite but be careful this one has a kick like a mule...! The other main beers are Tiger, Singha, and Heineken. The bucket is a peculiarity of Thailand where a small ice bucket is used to hold a quarter bottle of whiskey or other spirit and mixer and then this is drunk through straws. This one makes the Chang beer look timid. This really is a party bar in a party Island in a party country!! You get to the Phi Phi Sports Bar location by walking straight out of PP Palmtree Resort and it is just behind Phi Phi Banyan Villa and is close to Aquanauts Scuba.